The Aberdeen Family YMCA offers Nutrition Services to both members and non-members because we know that making the lifestyle changes can be difficult. A Registered Dietitian Nutritionist (RDN) is a food and nutrition expert who takes the science of nutrition and puts it into healthy living solutions for you. They are certified by the Commission on Dietetics Registration while continuing their education. A Dietitian will provide you with the best advice on food and nutrition to help you improve your lifestyle. Through measurements, diet history and goals, the dietitian will work hand in hand with you to make changing your lifestyle worth it for the long-term! Meet Your Registered Dietitian Nutritionist! Emily is a Registered and Licensed Dietitian Nutritionist. 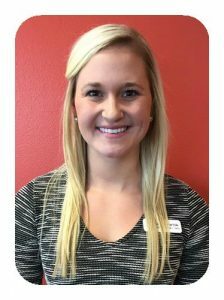 She received her Bachelor’s degree in Dietetics from South Dakota State University and completed over 1200 hours of supervised practice in the clinical, management, and community settings through Iowa State University. Emily’s specialties include: weight management, diabetes management, adolescent nutrition, and nutrition education within the community. Emily also has an interest in sports nutrition, as she recently participated in college athletics at the Division I level. Emily can guide each client in establishing a meal plan that uniquely fits their lifestyles. We are all unique with differing metabolisms, lifestyles and exercise habits. Incorporating proper nutrition to help you reach your short and long term goals is essential to succeeding in a lifetime of better health. Emily’s services vary from helping those that are new to exercise to beginner exercisers to athletes competing to reach their goals in high school and collegiate sports, marathons, and triathlons. She has experience with age groups ranging from adolescents to baby boomers. Through personal consultations, nutrition education classes, and more, we want to help you simplify the confusion that plagues your plate and help you get a real taste of success. If you are looking for advice on how to help manage your weight, improve athletic performance, or establish healthy eating habits, seeing a Registered Dietitian Nutritionist (RDN) might be just what you need! When it comes to seeing a dietitian in a hospital or private setting, the hourly price can range upwards of $100 an hour. Emily has made nutrition coaching affordable. Emily is also a personal trainer, and you can combine the benefits of working with a Personal Trainer and Registered Dietitian together, to get the best of both worlds. If you are new to the Y or have been a member for years, this might be the path for you to reach your goals. Emily will push you to your personal exercise limits while incorporating nutrition education allowing you to reach your goals, effectively and in less time. You can email Emily to get started. Lunch and Learns are a 50-minute class held in the Aberdeen Family YMCA Community Room that includes a free lunch while you learn how to eat healthy not only for yourself but your whole family! For the next lunch and learn date, please email Emily Newton or stop by the Front Desk. Lunch and Learns are free of charge for all Aberdeen community members. Sign up for Wellness Wednesday Tips by clicking here. Be sure to click the Wellness Center box when you add text alerts to your phone. Every Wednesday at 11:30 you will get a nutrition or wellness tip sent to your phone.